This quick-absorbing, high performance hand cream helps to moisturize dry, rough hands. AHAVA harvests the best in nature-inspired Dead Sea ingredients to create the finest mineral skincare. We incorporate the moisturizing properties of the Dead Sea - water, mud, salt, and plants - in every product. Powering the entire product range is our exclusive Osmoter™ - a blend of natural minerals sourced from the wondrous Dead Sea water contained in AHAVA products that will moisturize your skin for a smoother, youthful-looking appearance. 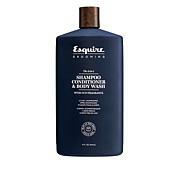 Ingredients: Aqua (Water), Ethylhexyl Palmitate, Cetearyl Alcohol & PEG-20 Stearate, Cetyl Alcohol, Sodium Cetearyl Sulfate, Glycerin, Hamamelis Virginiana (Witch Hazel) Flower Water,Propanediol(Corn derived Glycol), Maris Sal (Dead Sea Water), Parfum (Fragrance), Allantoin, Butylene Glycol & Calendula Officinalis Flower Extract & Propylene Glycol, Iodopropynyl Butylcarbamate & PEG-4 Laurate & PEG-4 Dilaurate & PEG-4, Zingiber Officinale (Ginger) Root Extract, Ginkgo Biloba Leaf Extract, Camellia Sinensis Leaf Extract, Panax Ginseng Root Extract, Methylisothiazolinone, Lactic Acid, Blue 1 (CL 42090), Alpha Isomethyl Ionone, Benzyl Salicylate, Coumarin, Eugenol, Hydroxyisohexyl 3-Cyclohexene Carboxaldehyde, Limonene, Linalool. The Best Hand Cream Around! I love my Ahava hand creams. Even my husband started using my cream, so I got him this one. 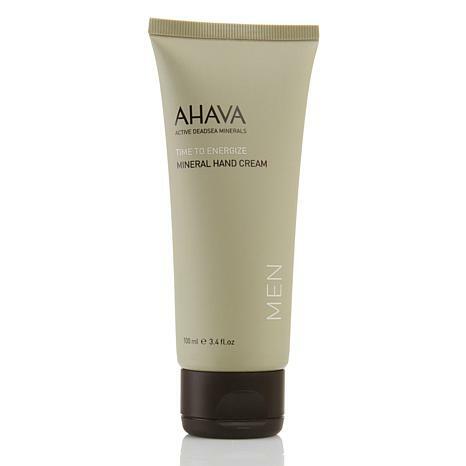 It's great Ahava has a line for men too.Please bring back the other scents for hand cream you had in the past! 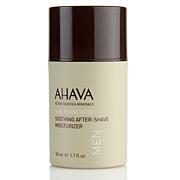 This and the other Ahava water, is the only lotion that helps with chapped hands and skin cracks. This has a manly clean smell. It's awesome. Ordered this hand cream for my husband. He loves it. It is nice and thick and works well. my son works out in the elements and his hands get chapped. they even crack and bleed. this lotion will help keep his hands moisturized.